Amani supporters have been BUSY! It is YOU, through your generosity, who make it possible for Amani to be there to rescue vulnerable children and give them the opportunity to have a better life. We never cease to be surprised with the commitment, creativity and generosity that our supporters show. In the last few months many people have done amazing things to fundraise for the children at Amani. Stephane and his son, Matthieu, took up running and Stephane ran a 50K race. 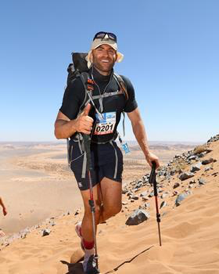 Damian, set the bar very high running the Marathon des Sables, an extremely challenging 257k race across the Sahara desert. That is not a typo, it is actually 257 km!! Milou, Daphne and Cycy challenged themselves to climb Mt. Kilimanjaro and paid us a most welcome visit after reaching the top. Our friends from Liaison – a UK company – climbed three peaks in one month, and Phil participated in the Great Birminghan Run to fundraise for Amani, as he has done five times in the last seven years. Inspired by all this action, 11 of the Amani kids ran the Half Kilimanjaro Marathon to fundraise for our sports program. But not everything has to be exhausting physical activity. Emma went through 10 challenges in 10 months and Anna managed – in record time- to fundraise for the water tank in our new Youth Transition houses. The Grads go Global team had a more fun approach and held their 4th fundraising party for hundreds of graduate students in Toronto. Cara, in an extremely generous gesture, is forgoing her wedding presents and asking people to donate to Amani instead. We want to send a special THANK YOU to these and many other Amani supporters who donate their time, their energy and creativity to give these children hope. You should be proud to know that with your effort you are transforming lives. Next Amani Sets New Record for Primary Graduates: 33!